18-year-old Ben Savage from Rochester missing after a night out. 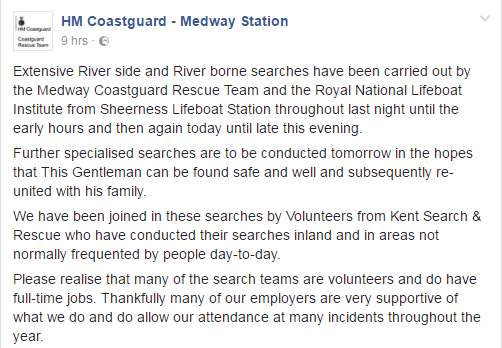 Groups of people have been out in chatham overnight carrying out searches for a missing teenager. 18-year-old Ben Savage is from Rochester was last seen on a night out earlier this week. Kent Police the teenager was last seen at 2.45am on Tuesday 6 December 2016 in Railway Street, Chatham. He had been out for the evening and his disappearance is considered out of character. We are continuing to search the area today and are reviewing CCTV footage to establish his last known movements. We are being supported by volunteers from Kent Search and Rescue and have also requested assistance from the National Police Air Service helicopter. 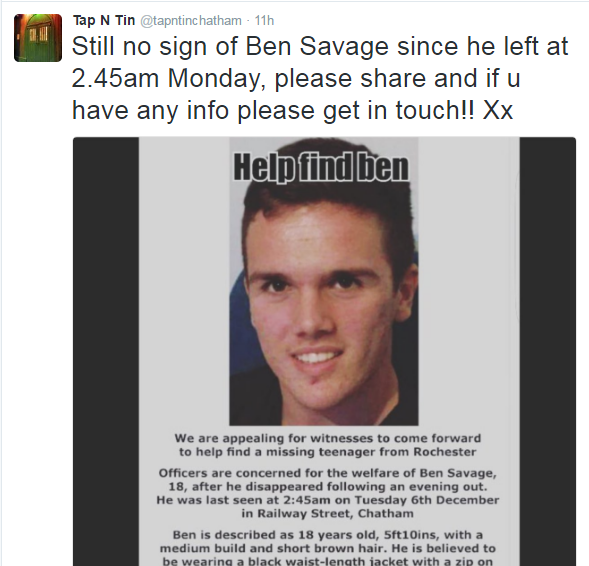 Ben is described as being 5ft 10in, of medium build and with short brown hair. He is believed to have been wearing a black waist-length jacket with a zip on one arm, a grey T-shirt with a large white number on the front, dark blue skinny jeans and black trainers with white detail. Anyone who may have seen Ben or knows where he might be is urged to call us on 101 quoting reference 06-0198.